Kris White’s excellent series on the bombardment and looting of Fredericksburg brings to mind one of the most enduring misunderstandings about the battle. The story goes like this: The Union army, trapped on the north side of the Rappahannock River, waiting in vain for pontoon boats to arrive, could’ve easily waded across just north of Fredericksburg. Instead, they frittered away their element of surprise. The delay cost them weeks, and they were forced instead to do foolish and vain headlong assaults against the Sunken Road and Stone Wall. That’s just further proof that Ambrose Burnside was an idiot, right? So why didn’t the army just walk across? Jeff Shaara’s Gods and Generals helped solidify the myth in public consciousness: Union division commander Major General Winfield Scott Hancock, frustrated by the endless delay waiting for the pontoons, walks down to the riverbank on a frosty morning and, there, happens to see a herd of cows cross the Rappahannock. 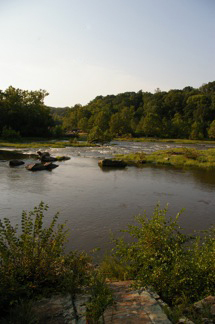 And indeed, the Rappahannock is shallow enough to walk across just north of town. The river, flowing east, makes a wide bend southward, descending a series of rocky falls before smoothing out just as it flows past by town. 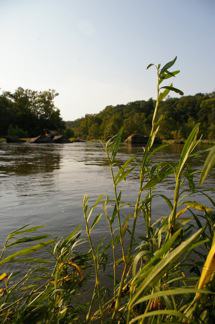 There, below the fall line, the Rappahannock gets deeper and wider and rises and falls with the tug of the far-off tide. It’s there, directly opposite the town, across the deeper, wider section of river that Burnside will build his pontoon bridges then they finally arrive. The wait takes weeks. In the meantime, Hancock personifies the frustration of the Union army and the desire of the men to get across and strike a blow. Hancock assures him it is and suggests they move the entire Second Corps across the river by nightfall. Alex Hyde-White’s portrayal of Burnside in the movie version of Gods and Generals came across as particularly dismissive. Shaara spends much time thereafter sympathizing with Hancock as the division commander stews in his own juices. As one of the novel’s main heroes, Hancock enjoys a privileged position in the narrative, and so his opinions enjoy privilege, too. The author takes Hancock’s side in the debate, and readers do, too. Hancock’s solution seems so obvious, Burnside’s opposition so thickheaded and wrong. Because Burnside is already so easy to vilify, the misconceptions captured in this episode just add fuel to the fire. But, you see, Burnside really didn’t have the luxury of deviating from the larger plan, despite any assertions by Shaara’s characters that “he can deviate from any plan he chooses.” The shadow of the Emancipation Proclamation cast a political pall over Burnside’s every move. On top of that, the Army of the Potomac was, by its very nature, a political beast. Most people today, then, just don’t appreciate the incredible political pressure Burnside labored under. The over-the-shoulder observations of Lincoln, Stanton, and Halleck—not to mention the specter of the recently fired McClellan—made it nearly impossible for Burnside to even flinch without someone second-guessing it. Political considerations aside, Burnside had reason to be concerned about the river itself. He didn’t have the benefit of Doppler radar to tell him what weather might be blowing in from the west—or what weather conditions might be out there already near the river’s headwaters. A rainstorm could make water levels rise precipitously, and if that happened with part of the army on the far bank, those men would be cut off, making them vulnerable. Burnside’s point about the wagons, too, was valid. The rocky stretch of river Hancock pointed out would not have been wheel-friendly, so wagons would’ve had a tough time. It would be no small thing for part of the army to position itself across the river without any supplies. Now imagine if they got cut off. Oh yeah, that pesky artillery that Shaara conveniently leaves out of the argument altogether (perhaps because it might strengthen Burnside’s position). What about that artillery? While Shaara does at least present Burnside’s perspective, he paints Burnside as a dunderhead by oversimplifying the argument in Hancock’s favor: if a cow can cross the river, surely an army can, right? This plays to the “Burnside was an idiot” stereotype, so readers don’t give Burnside’s rationale any credence. Shaara does this, at least in part, because his hero, Hancock, needs a foil to play against. Hancock looks more heroic if Burnside looks more idiotic—and the Union defeat at Fredericksburg looks all the more tragic. Whether Burnside was a complete idiot or not remains a question we’ll explore in future posts, but at least in this instance, he had smart reasons for keeping his army safe on the north bank of the river. This entry was posted in Battles, Books & Authors, Leadership--Federal, Memory, Politics and tagged Ambrose Burnside, Burnside, Fredericksburg, Gods and Generals, Hancock, Jeff Shaara, Rappahannock River, Winfield Scott Hancock. Bookmark the permalink. At the risk of repeating myself (from the Reynolds post), I’m with you. Again. “Simply” wading across the Antietam next? Harry, please repeat yourself all you want. Glad to have you reading! Great post and excellent analysis. Hmmm–maybe this is why Middle School and High School teachers shouldn’t show movies and read novels as the bulk of their curriculum. Any yet . . . so many do. Once in a while a student will ask me just where Owl Creek Bridge is. I’m actually a big fan of showing movies as a way to snag a student’s interest–but then it’s incumbent on the teacher to explain away the movie’s myths and kindle enough excitement for the student to go learn more on his/her own. We get a lot of battlefield visitors that way! Thank God, some valid analysis of Ambrose Burnside. Time and time again do I have to defend him in my work at Petersburg National Battlefield. Thanks, Emmanuel. I know Burnside is as tough to talk about there in Petersburg as he is in Fredericksburg. I’m no Burnside apologist by any means, but he wasn’t a TOTAL idiot. Glad to have you reading!